The Frederick purple passion flower and fruits pictured on the right were photographed in the middle of May. This passion fruit vine was planted in May 3 years before, and this was the first time it flowered. It was frozen to the ground after its first year, so it has only been 2 years since it started recovering. It recovered true to type because it was grown from a cutting rather than grafted. The fruit from these flowers ripened in late June, about a month and a half later, and were delicious. I knew they were ripe because they would fall to the ground. The fruit keeps for at least a week on the kitchen counter. The vine did not flower anymore during the summer, probably because of the heat. This vine is growing on a chicken wire trellis on an east facing wall. I fertilize this vine frequently in the spring, every two weeks, starting in the middle of February, giving it both 5-1-1 and 0-10-10 fish emulsion. I also fertilize it during the summer but less so, and occasionally give it chelated iron. The passion flowers on this plant were self-pollinated by hand, to encourage greater fruit set. When the flowers were open, I broke a square stamen off of one of the flowers and rubbed it on the trumpet like stigma of all the flowers. 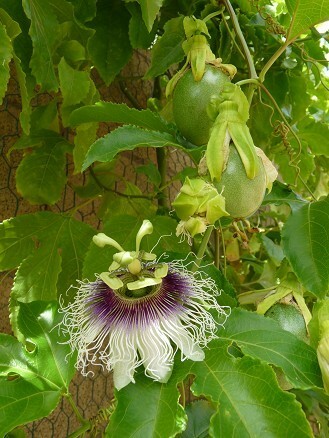 Certain varieties of passion flower vines will do well and even bear fruit in the lower desert. Plants do better in general with afternoon shade in the summer and with a protective microclimate in the winter. The best fruiting varieties for Phoenix are Frederick (a purple passionfruit variety), Blue Crown, and Incense. The flavor of Frederick is the best, followed by Incense, and then Blue Crown. However, Incense will need hand pollination to fruit. Blue Crown is the most cold resistant, followed by Incense, and then Frederick. One of best non-fruiting varieties is P. alatocaerulea (aka Pfordtii), a hybrid of Blue Crown. A passion fruit plant's adaptability to Phoenix's climate varies greatly by variety. Detailed below are summaries of varieties tried in the Phoenix area and the outcome. Sweet Granadilla (Passiflora ligularis) This variety is nicer for eating fresh than many passion fruit varieties because its flavor is sweeter and milder. It is generally not used for juice. The seeds are relatively chewable, unlike the rock hard seeds of many of its relatives. The outside of the fruit has a firm yet thin shell, like that of an egg. Sweet granadillas have distinct dark green heart shaped leaves. While it does great in Phoenix in spring it cannot take the summer heat, even in full shade. When temperatures get much over 100 F. this plant simply wilts and dies. San Diego, California is probably an ideal climate for it. Does well in the spring and fall but is generally in a state of decline during both winter and summer. Produces impressive flowers in spring but does not produce fruit in our climate. This plant is best used as an annual in Phoenix, and should be planted in early March. Yellow Passionfruit (Passiflora edulis flavicarpa) The most tropical of the passionfruit varieties, and a major commercial crop used in fruit juices. The flavor of its fruit is more tart and stronger than that of its closest relative the purple passionfruit. It tolerates lower desert summer heat well if given some afternoon sun protection. Winter cold doesn't seem to be a problem as long as this plant is grown in a frost free microclimate, such as a against a concrete wall or next to the house. It is officially hardy to 30 degrees F., with the roots being hardy to 26 F. It requires cross pollination to fruit. Unfortunately, yellow passionfruit do not seem to flower in Phoenix, and do not show the extreme growth that passionfruit vines are known for. Purple Passionfruit (Passiflora edulis ) A subtropical passionfruit variety, and a major commercial crop used in fruit juices. It is known to be better for eating fresh than yellow passionfruit because it is sweeter and not quite as acidic. In some climates, purple passionfruit vines are often grafted on top of yellow passionfruit vines because the yellow is more resistant to soil born diseases. Otherwise, select varieties are grown from cuttings. The fruits are purple externally when ripe and are filled with orange pulp. Heat and cold tolerance are similar to the yellow passionfruit, but the purple is slightly more cold tolerant possibly hardy into the mid 20's F. It grows vigorously in Phoenix and produces both flowers and delicious fruit. "Frederick" is a self fertile purple passionfruit variety of high quality that can be found in local nurseries. Blue Crown (Passiflora caerulea) A vigorous grower which tolerates summer heat well if given some afternoon sun protection. Once well established it has been known to successfully extend itself into full sun. It is recommended by Sunset Western gardening handbook for our lower desert climate. Being hardy down to 15 F., there is no reason for concern about frost damage in Phoenix. Its roots can withstand even colder temperatures, so this plant is even a candidate for many mild winter climates where the ground does not freeze hard. Its blue, black, white flowers smell minty, and are self fertile producing distinct orange fruit with red pulp. Fruits are not very palatable fresh but can be combined with other foods and juiced to add an interesting flavor. The flavor is somewhat berry like. P. alatocaerulea (aka Pfordtii) - A non-fruiting variety very common in local nurseries. Incense (Passiflora incarnata x cincinnata) This plant is able to take the Phoenix summer heat with a bit of afternoon shade. Being hardy to 30 F., it will reliably resprout in the spring if frozen to the ground. The ability to lay dormant over the winter is inherited from its seed parent P. incarnata (aka the Maypop). In fact P. incarnata is so resilient that it grows natively in the South Eastern U.S., and has the hardiest roots of all passion flowers. Incense is recommended for our lower desert climate by Sunset Western gardening handbook. Strong smelling sweetly scented flowers are followed by tasty yellow fruit. This plant needs cross pollination, and possibly hand pollination to fruit, since its native pollinators are not present in Arizona. 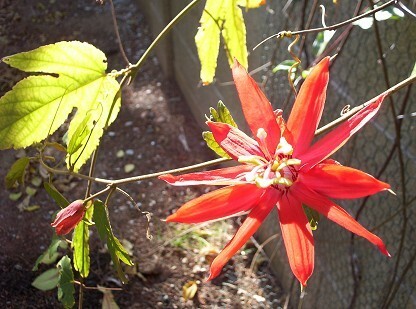 Rubby Glow/Fragrant Granadilla (Passiflora alata) This plant is known for its sweet smelling beautiful flowers. It has oval leaves, which puts it in the granadilla branch of the passion flower family, also meaning it is not bothered by butterfly larva. This plant needs cross pollination, and possibly hand pollination to fruit, since its native pollinators are not present in North America. It produces nice tasting yellow fruit with white flesh. Unfortunately, it does not flower in Phoenix, and suffers in both summer heat and winter cold. Like its other Granadilla relatives it is better off in a milder climate. from the pulp. It is important to let passionfruit fully ripen before eating them for both flavor and health reasons. A very green fruit can make you ill. A fully ripe fruit will separate easily from the vine or even fall to the ground on its own. Very ripe fruits quickly become wrinkly and can still be eaten in this state if not too old. Passionfruit juice can be delicious by itself or combined with other fruit juices. The first time many people try passionfruit they realize they are already familiar with the flavor because it is mixed into so many of the commercially sold juices. In fact, one of the main components of Hawaiian Punch is passionfruit juice. In Hawaii, passionfruit is referred to as lilikoi. The simplest passionfruit drink you can make at home is similar to making lemonade, just combine the pulp and juice with water and sugar. Passionfruit is fairly strong flavored so it doesn't take very many fruits to make a gallon of passionade. My favorite passionfruit drink is made by mixing passionfruit juice in homemade lemonade/lime juice. I mix lemon juice from 1 large lemon, lime juice from 3-4 small Mexican limes, and strained passionfruit juice from 1-2 purple passionfruits, with 2 cups of sugar and a gallon of water, and optionally add a little more sugar after taste testing. Varieties that can take summer heat will generally do better with afternoon shade. Cold tolerance varies greatly by variety. See the above variety listings for more information. Passion flowers do well on a grass watering schedule. Passion flower plants are heavy feeders. During warm and hot months a steady supply of nitrogen can be provided using a slow release fertilizer, or alternatively using organics, such as frequent applications of balanced fish emulsion. Fertilizers with soil acidifiers will help the plant to stay greener. Composting above the plants roots will also help to conserve moisture and amend the soil. Passion flowers are well known for growing rapidly and can be quite invasive. Pruning might be necessary to keep them from smothering other plants. Carefully choosing a planting location away from other plants can make your life easier. Passion flower vines are easily propagated from seed. Vegetative propagation from cutting and grafting is the only way to insure the parent plant's characteristics will be preserved. 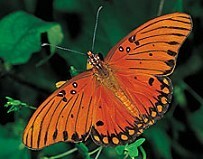 Passion fruit vines are a favorite host plant of the Gulf Fritillary. This beautiful butterfly's caterpillars are black and spiny and very hungry. If your plant is new and tiny you'll probably want to manually kill the caterpillars before they wipe the plant out. Once your plant gets large, you can let them dine as they please because they will generally not do significant damage. Later on you'll be rewarded with colorful orange butterflies.